Novogradac & Company and PolicyMap have updated this tool and the data in the searchable maps below reflects the 113th Congressional district boundaries as determined by the 2010 census. On Oct. 31, 2017, the CDFI Fund released updated 2011-2015 American Community Survey (ACS) low-income community (LIC) data for the New Markets Tax Credit (NMTC) program. The new data can be used beginning Oct. 31, with a one-year transition period in which applicants can alternatively choose to use 2006-2010 data. 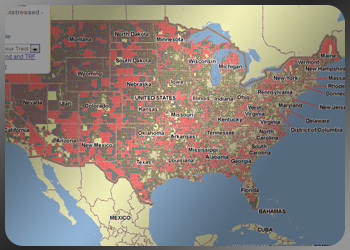 During the one-year transition period, both sets of data will be available in in the NMTC Mapping Tool. The new 2011-2015 data is displayed by default. When a user clicks on the map, the info bubble displays values based on the 2011-2015 eligibility data. To change the time frame to 2006-2010, click on “Edit Data” in the legend, and adjust the time frame there. The data that displays will then be 2006-2010, as will the data in the info bubble. NMTC industry participants may complete the NMTC Mapping Tool Participation Form to share data points for inclusion in Novogradac & Company's NMTC Qualifying Census Tracts Mapping Tool. Please submit questions or report problems using this NMTC Mapping Tool Error Form. As part of its efforts to ensure that non-metropolitan counties receive a proportional allocation QEIs under the NMTC program, the CDFI Fund published this list identifying 6,488 NMTC-eligible census tracts located in non-metropolitan counties. The CDFI Fund says these census tracts qualify for NMTC investments because they have a poverty rate of at least 20 percent and/or a median family income that is at or below 80 percent of the applicable area median family income. This Census Bureau map shows metropolitan and micropolitan statistical areas, metropolitan divisions and their component counties. Click the image for a larger version. *Note: Rural areas can be in both Metropolitan and Nonmetropolitan areas. Source: U.S. Census Bureau, Census 2000 Summary File 1, Matrix P1. Within Urban, you have Urbanized Areas and Urban Clusters. An urbanized area (UA) consists of densely settled territory that contains 50,000 or more people. An urban cluster (UC) consists of densely settled territory that has at least 2,500 people but fewer than 50,000 people. Rural consists of all territory, population, and housing units located outside of UAs and UCs.